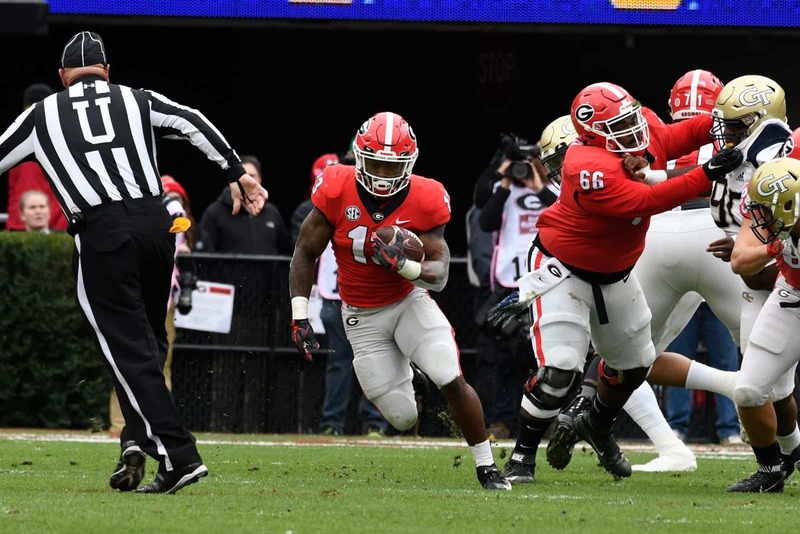 The Georgia Bulldogs, who defeated the Georgia Tech Yellow Jackets 45-21 on Saturday, have moved up to 4th in the AP Poll and Coaches Poll for Week 14. Georgia received 1,336 points in the AP Poll, which is up 48 points from the Week 13 poll. In the Coaches Poll, UGA received 1,398 points, up 51 points from Week 13. Georgia and Alabama are set to square off in the 2018 SEC Championship Game on Saturday, Dec. 1 at Mercedes-Benz Stadium in Atlanta. The game is set for 4:00pm ET and it will be televised by CBS (Buy Tickets). Dropped from rankings: Utah State 14, Pittsburgh 24. Others receiving votes: Utah State 92, Missouri 88, NC State 39, Cincinnati 33, Stanford 10, Iowa 4, Oregon 1, Appalachian State 1, Buffalo 1. Dropped from rankings: Pittsburgh 25. Others receiving votes: Iowa State 103, Cincinnati 82, NC State 55, Missouri 33, Iowa 20, Appalachian State 14, Pittsburgh 13, Memphis 6, UAB 4, Stanford 3, Buffalo 3, Oregon 3, California 1, Wisconsin 1, Georgia Southern 1.